We are expecting to use more electricity in buildings as designers plan for a low carbon economy. While electricity demand will increase, so too will prices as we continue to fund green production. Secure open source building automation will help operators improve building responsiveness and efficiency. The government has committed to a low carbon economy. To hit the carbon budget by 2050 it is likely the UK will need to fully decarbonise how we heat and cool our homes and businesses. This is likely to mean less gas and more heat-pumps. Some businesses will be easier to decarbonise than others. Some-like aviation-will need the use of not-yet-invented technologies. In the short-term, a dedicated building management system has advantages and may seem attractive . However, as time passes, being locked into a single system or supplier can present cost and operational disadvantages. For building designers and operators, building management is evolving. As IoT and IIoT grow, opportunities exist for rethinking building management systems. Moreover, there is a need to increase security and ensure effective adoption and utilisation of new technologies. The problem for building operators is the many different protocols, standards, and products to integrate into the BMS. There are also security issues related to current PC based systems introduce infiltration risks. Building design technology is getting more complex. Advance building automation systems need to meet ongoing trends in energy conservation. 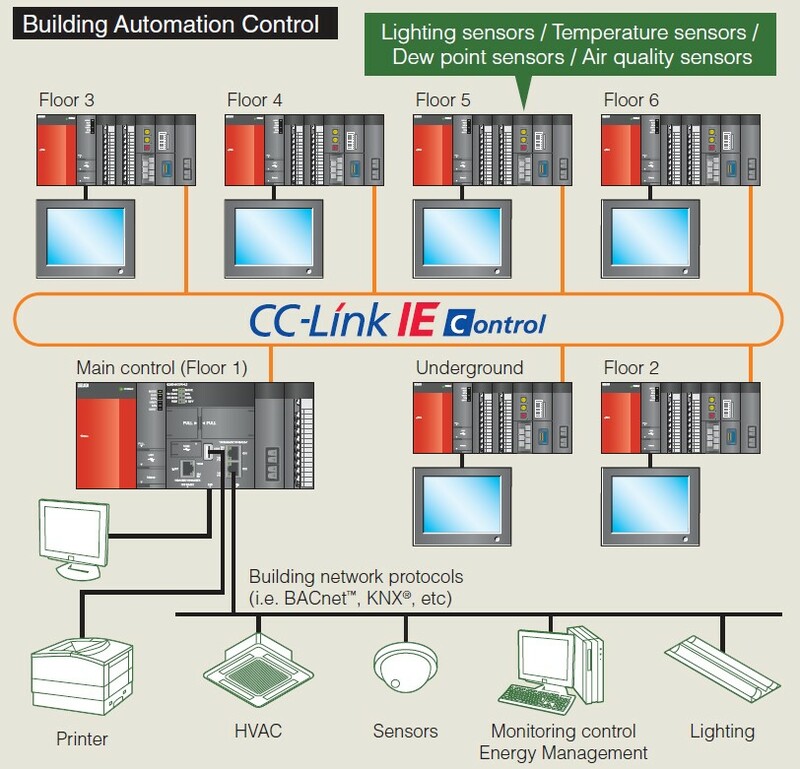 A typical building automation system comprises of different elements integrating devices from various manufacturers. This example of a retrofit application also integrates its devices using various network protocols. The main control system uses an OS-independent Mitsubishi C Controller Q12DCCPU using a local Linux based OS software solution. Security requirements were a major driver, and the use of an open source controller. This provided the capability to install advanced energy management algorithms. Building automation, like infrastructure solutions are susceptible to serious online security threats. Selecting a Linux based solution, offered more control over security deployment without disrupting the system. The controller’s C language-based programming supported the writing of application specific code. This enhanced the HVAC and lighting control systems. Other energy saving devices such as Inverters and a diverse range of I/O also implemented into the system. The result was an efficient and energy conserving outcome. Secure open source building automation has several advantages besides increased security. Sensor-based control solutions, AI and advanced algorithms make buildings responsive to real-time conditions. They no longer tied to a pre-set programme. Finally, as new technologies evolve, they are easy to integrate and adapt to secure open source building automation.